Summary: The current debate over data and multiple choice assessment has been miscast as a debate over Big Data and High-Stakes Testing. Let’s get the discussion back on track by looking at how teachers can use Micro-Data and Low-Stakes Assessment every day to achieve personalized instruction and better outcomes. I believe in the power of data to improve learning outcomes and enrich lessons. I know this because research has shown it, and because I myself have used data over the past ten years to create better lessons and educate my students. 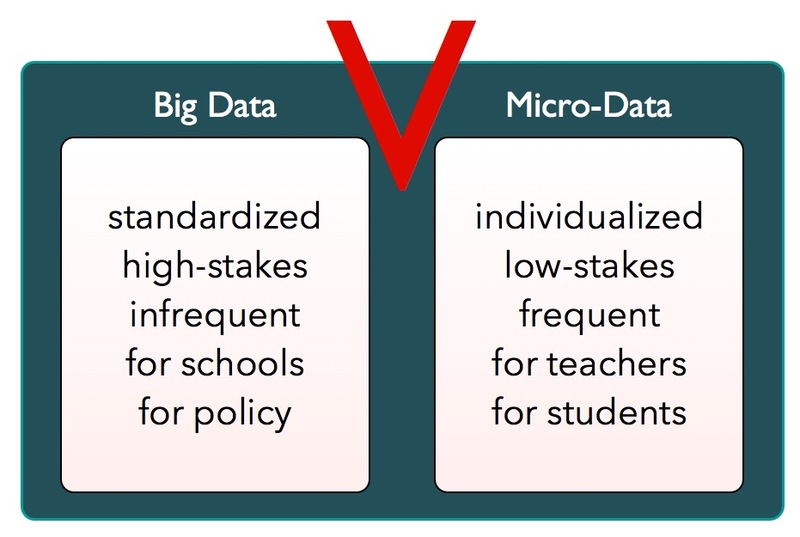 But I think the discussion around data is lacking an important distinction: the difference between “Big Data” (a tool for schools) and what I call “Micro-Data”, a tool for teachers. Micro-Data is what I use in my daily lesson planning: the results of daily formative assessments that help me gauge my students’ mastery of today’s lesson. In this paper I will introduce the concept of Micro-Data, and explore the differences between Big Data and Micro-Data. My hope is to provide a starting point for educators to think about how to use Micro-Data to achieve higher learning outcomes, and look at ways to use Micro-Data without spending aeons crunching numbers! I also want to show that Micro-Data is not about testing ruling the classroom. It’s about a foundation of data to underpin exciting, project-based activities and lessons. At my school, we do testing twice per semester, and we also have the Massachusetts MCAS exam once per year. When the results from these assessments come back, I go to work adjusting my lesson plan. This is long-cycle assessment. Big Data. I might be able to catch up my current students in the next semester, but the main beneficiaries of these analyses are next year’s kids. Big Data like this is useful to my school, which can track students and teachers across years. The data are also useful to me, to an extent. But the benefit to students, while not minimal per se, is at the very least telegraphed into the next year: I apply the last year’s data to this year’s kids, and what I learn this year, I can only apply to the next year’s kids. This is Big Data in action. I’m glad my school uses Big Data to improve outcomes for our students. But as a teacher I need something different. I need data to help me teach the kids in my classroom today. Big Data doesn’t do that for me. Micro-Data (n) is the product of short, frequent formative assessments, is collected, analyzed, and applied within 24 hours, and is linked to an individual student, in order to provide personalized instruction. Micro-Data is all about finding out whether my students understand what I just taught, or if they did the reading, or met the learning goals of the day’s project. It isn’t about graded assessments. And it isn’t about putting standardized testing at the center of class time. It is about getting real, hard data, fast, so I can spend class time having fun while learning with my students, and giving the right attention to each individual learner. This last point is critical, because as I will discuss later in this post, one way to collect Micro-Data is the short multiple-choice assessment. I worry that the current discourse has conflated multiple choice and standardized testing (Big Data), making one part and parcel of the other. As teachers we need to re-cast not only the discussion, but also the way we think about the assessment tools available to us. As a working teacher who has had to bear the weight of every policy change and technology implementation of the past 14 years, my concern is that Big Data will come to dominate the national discussion – and my classroom – at the expense of Micro-Data. I am encouraged, though, by the active, involved, and progressive teachers who are adding their voices to the national discussion. As teachers, we need to make sure we are in the driver’s seat on every education issue, including technology and data. It is true that the historical cost of technology has meant school administrations hold the keys to data. But the landscape is shifting. Today, high-powered technology is in the palms of our hands, and we can can give ourselves the power to teach using Micro-Data for very little (if any) money. As teachers we need to get out in front of the trend toward Big Data. Experience shows that frequent, low-stakes assessment works. Let’s make sure we aren’t measured by Big Data without being given the tools to harness Micro-Data. With a solid concept of what makes good Micro-Data, teachers can begin to develop methods to collect and use data from frequent, short formative assessments that fit with their existing lesson plans. There are technology tools available for little or no money that make assessment easier and faster, enabling teachers to create assessments that fit all of the criteria of good Micro-Data. And finally, the power to use data needs to be universally accessible. Having taught in public, charter, and private schools in Los Angeles, inner-city Detroit, Washington, DC and Boston, I am a witness to the consequences of unequal access to technology. The digital divide and the achievement gap are devastating our social fabric and the lives of children everywhere. Technology (and data) might be tools to help solve these problems, or they might be wedges that further isolate the “haves” from the “have nots”. In class: walk-arounds (with a way to record assessment results), voting, and team projects can all be sources of Micro-Data, so long as the results are discrete and recorded in a way that allows analysis. In paper-based classrooms, use one of the many quiz scanning apps for iPhone and iPad to speed grading and analytics. Your own students! Many teachers successfully use self-grading or peer-grading to speed up the analysis of Micro-Data. For those who are totally opposed to testing, I say this: Micro-Data is classroom intelligence you can use to ensure your rich, engaging lessons are tailored to individual student’s needs. Micro-Data doesn’t replace or de-value project-based instruction. Rather, it helps to make sure fundamental concepts are mastered during rich, engaging lessons. Micro-Data is about discovering whether an individual has mastered today’s lesson, and taking immediate corrective action. Many of the ideas behind Micro-Data are not necessarily new, but by putting a name to them we create a framework for developing best practices. The concept of Micro-Data allows us to talk about data-driven methods without the distracting shadows of Big Data and Standardized Testing clouding the discourse. 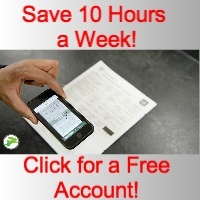 Powerful new tools are being built every day. But only when we know what we need from technology, and have the language to demand it, will we gain access to the tools that give us the power to teach. And only when we teachers make our voices heard, in a clear, cogent discourse about data, will we be able to gain control of our collective digital destiny.